Product Availability: Stock reports there should be low level quantities in store at this time. To reserve stock please place an order online (*no* payment details or commitment required to place order online, but please only order if you plan on getting it (stock availability dependent)). 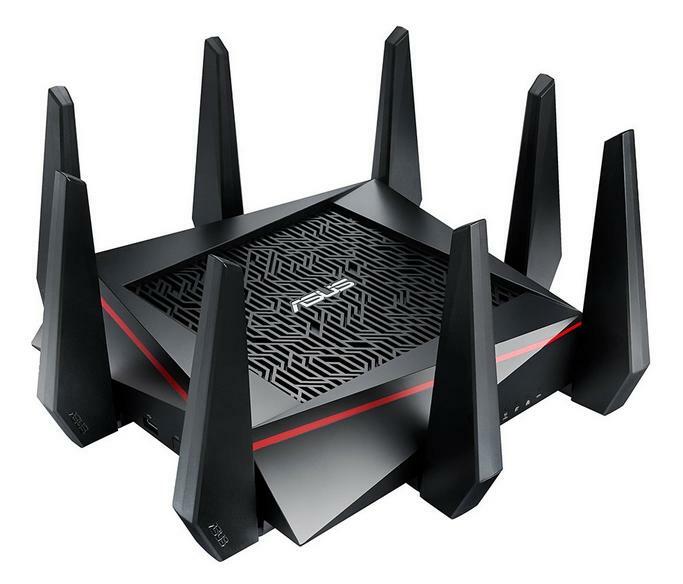 802.11ac tri-band Wi-Fi router boosts speeds up to 5334Mbps for low-latency online gaming, smooth 4K UHD video playback and extremely fast file-sharing. Tri-Band Smart Connect automatically selects the fastest of the three available frequency bands for each device, based on the device’s speed, signal strength and how busy each band is. 4x4 antenna design with AiRadar universal beamforming for unrivaled Wi-Fi range. This product was added Thursday 17 December, 2015. This product was last modified on Thursday 14 February, 2019.